Legal Pressure Increases on Unpaid Internships in U.S.
WASHINGTON, Jun 15 2013 (IPS) - A landmark court decision this week has challenged the controversial existence of unpaid internships, highlighting calls for greater clarity on the legal definition of an internship. The judge, William Pauley, ruled that Fox Searchlight Pictures, a movie studio, violated U.S. and New York minimum wage laws by not paying two of its interns during the production of a 2010 movie, “Black Swan”. In the “Black Swan” case, plaintiff Eric Glatt, a law student and former accounting intern during the movie’s production, called unpaid internships “a form of institutionalised wage theft”. According to a report by the National Association of Colleges and Employers, 55 percent of the class of 2012 in the United States had an internship sometime during their time at school, and 47 percent of those were unpaid. "Just because somebody is receiving experience doesn't mean they shouldn't get paid." 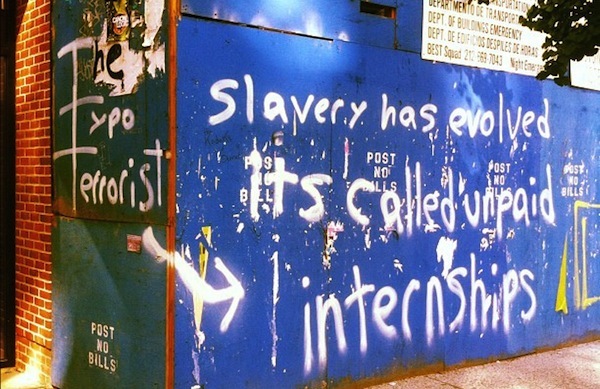 Up to 1 million unpaid internships are offered each year, according to estimates by Ross Eisenbrey, vice-president of the Economic Policy Institute, a Washington think tank. Further, he said the number of unpaid positions has increased in the aftermath of the 2008 economic downturn. Eisenbrey also blamed unpaid internships for bringing down overall wages. Under the Fair Labour Standards Act, the U.S. Department of Labour has outlined six criteria for a position to be considered an internship and thus be legally unpaid in the private sector. Among them are requirements that the experience must be for the benefit of the intern and the employer cannot derive any immediate advantage from the intern’s work. If the six criteria are not met, interns must be paid according the minimum wage or more. This week, Pauley ruled that the “Black Swan” interns did not receive any training similar to that of an educational setting, one of the criteria given by the Department of Labour. “The benefits they may have received – such as knowledge of how a production or accounting office functions or references for future jobs – are the results of simply having worked as any other employee works,” the judge stated in the ruling. 20th Century Fox, the parent company of Fox Searchlight Pictures, issued a statement expressing its disappointment with the ruling, calling it “erroneous” and saying it would appeal. “I hope this sends a shockwave through employers who think, ‘If I call someone an intern, I don’t have to pay them,'” Glatt said. Last month, another federal judge in New York declined to allow a class action lawsuit proceed against the Hearst Corporation, a publisher, challenging unpaid internships at Harper’s Bazaar, one of the publisher’s magazines. In that case, Diana Wang, a former Harper’s Bazaar intern, filed the lawsuit on behalf of all Hearst Corporation interns. But a judge denied the class action status because Wang couldn’t prove that all Hearst interns had faced similar conditions. On Thursday, two previous magazine interns filed a lawsuit against another U.S. publisher, Conde Nast Publications, for failing to pay them minimum wage. The lawsuit is currently waiting to receive class action status. For some advocates of changes to U.S. labour policy regarding internships, the overall goal needs to be to turn those unpaid positions into entry-level positions. Still, others say achieving this goal would be very difficult. Brantley Davis, of the advocacy group Coalition for the Future American Worker, estimated that eliminating unpaid internships stands just a 10 percent chance. In 2010, federal and state labour official did indeed move to crack down on illegal internships. But at the time, few plaintiffs came forward. That now appears to be changing. Over the past two years, six lawsuits have been filed demanding minimum wage compensation for activities performed as interns.